There is nothing better than a sharp knife in cooking. Seriously, once you get your first sharp chef's knife you will instantly feel like the next Mario Batali. You cook faster, more precisely and one good knife in your cupboard is all you need. My recommendation for you kitchen novices is to invest in one great knife. Chef's knives are best for this investment since they can really be used for anything. Every department store and kitchen store these days has tons of options that you can browse and actually try. Some are more expensive than others, but really you can stay within a reasonable budget and get a fab knife. I would also recommend that you get a knife sharpener. Since you will be whipping up tons of amazing meals with your new tool, you will want to sharpen regularly because as soon as it goes dull it loses it luster quickly. 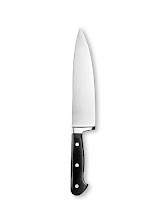 Above is a picture of my favorite knife that can be purchased at WWW.Williams-Sonoma.com. It is the Wusthof Classic Chef's knife. There are multiple sizes, but 6 inches is just perfect for your first knife investment. Enjoy your new tool!